!!! Open for submissions next Sunday May 20th at 7:00 PM (CEST) !!! It's almost weekend and that means time for another Carpe Diem Weekend Meditation. This weekend I love to challenge you in a special way. As you all know I am the inventor of the Troiku (more on Troiku above in the menu) and I know that you all like to create Troiku. This weekend meditation you have to create a Troiku, but in another way than usually. A while ago I started Carpe Diem Crossroads, the "fusion"-haiku challenge, also a great new feature and I know you all like that feature too. So for this weekend I will give you two haiku, as in Crossroads. You have to create a "fusion"-haiku from those two haiku and than create a Troiku with your "fusion"-haiku. A nice challenge I think fortunally you have the whole weekend to create it. This weekend I challenge you to create a "fusion"-haiku with these two haiku and than create a Troiku from your "fusion"-haiku. A nice challenge for this weekend meditation I think and I am looking forward to all of your beautiful submissions. 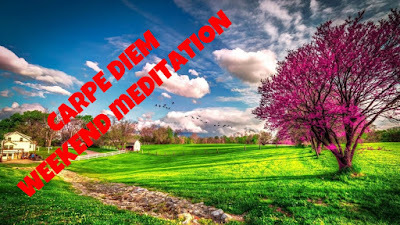 This weekend-meditation is open for your submissions next Sunday May 20th at 7:00 PM (CEST) and will remain open until May 27th at noon (CEST). Have fun ... and I hope you all will have a wonderful weekend ... enjoy it to the max!